Bushsports introductory climbing day instructs you in the skills suited to climbing the great outdoors! No previous experience is necessary, just a basic level of fitness and the desire to climb. These two pages give you an overview of what we cover. Climbing is tailored to suit your ability and interests. 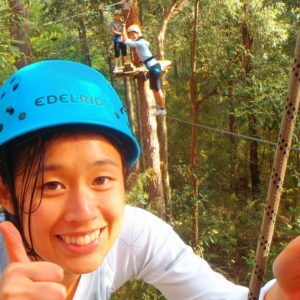 Ideal for: individuals increasing their climbing grades, groups for fun and superb team building events. Trips depart from Katoomba to Mt York and Mt Piddington for a brilliant days climbing. The famous Blue Mountains make for one of the most inspirational climbs you will ever complete. Meet the guides in the morning and select the climbs you wish to complete or allow them to suggest some of their favourites. An easy start to the day warms and loosens you up. 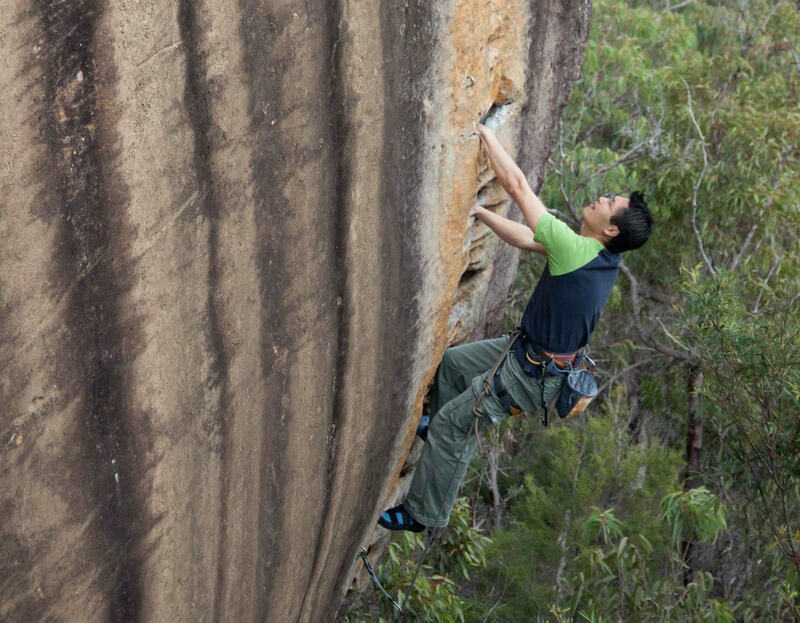 Tie in to climb sandstone cliffs perched high above the Valley floor or layback conquering Mt York, Mt Piddington. Pitches, led by an experienced climbing guide, take you on a vertical path to the most spectacular vantage. Help is always at hand, guides support, encourage and show you techniques to improve your grades. Turn your back to the amazed tourists, feel the exaltation on a remarkable achievement. Rap-off (abseil) and head to the next climbing route. Provided: Padded climbing Harnesses, helmets, belays including Gri-Gri, expert instruction / guiding, healthy lunch & morning tea. Guides: Experienced rockclimbers able to make learning easy and enjoyable, dedicated to their passion. Physical conditioning: strength development, endurance. Attitude: commitment of mind & body. Awareness of safety. Footwear: depends on climbing environment and rock surface. Clothing: ensure freedom of movement, appropriate to weather. Tape: protect hands from abrasion or support damaged fingers. Chalk: improves grip, leaves unsightly marks, toothbrush. Rope: characteristics, static or dynamic. Helmets: type, style. Sydney Basin/Blue Mountains: Hawkesbury sandstone or Burramoko-head. Check natural & artificial protection. 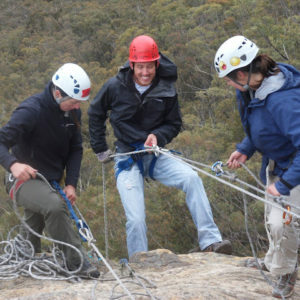 Determine route, visual inspection, decide on belay technique. Belay: Stitch plate, Bugs, Gri-Gri, other. In system & out of. Set-up ropes selection of, characteristics (knots- figure 8 & tape knot), harness & helmet on. Conserve energy; plan move, then execute. Hang on straight arms. Holds; Selection, inspect quality, survey route. Footholds: Edging inside or outside, between ball and big toe. Smearing. Handholds: Used for balance, counter-pressure or raising. Opposed, stacking, cling. Techniques: Down-pressure, Mantel, Counterforce, Undercling, Stemming, Lieback. Jamming – hand, fist, finger, toe, foot & body. Counterbalancing. Face or slab. Cracks or dihedral. Chimneys, overhangs & roofs. Traversing & Exiting onto ledges. Challenge climber against rock. Respect of rock & life? Redpoint or Flash!! Bolting? Warning a climbing course does not replace vigilance, and well practiced techniques!! Further learning & instruction is required. Click on your adventure destination for more details.